The Lilac Fire — which swept through the San Luis Rey Downs Training Center near San Diego and claimed the lives of 46 horses last December — has been designated the National Thoroughbred Racing Association‘s 2017 “Moment of the Year,” the association announced Wednesday. The tragic blaze, represented on Twitter by the hashtag #RememberSLR, garnered 25.5 percent of the overall voting — 843 of a record 3,303 votes cast via Twitter and an online poll, according to the NTRA. The fire was among 13 events from which voters could select, including Arrogate’s win in the $10 million Dubai World Cup last year and the death of Secretariat’s owner, Penny Chenery, which finished in second and third, respectively, in the voting. Those who rushed into action to help save horses during the Dec. 7 blaze at the training center in Bonsall will be honored with Special Eclipse Awards at a ceremony Thursday in Hallandale Beach, Florida, event organizers announced earlier this month. “The Special Award honors extraordinary service, individual achievements in, or contributions to the sport of thoroughbred racing,” organizers said. 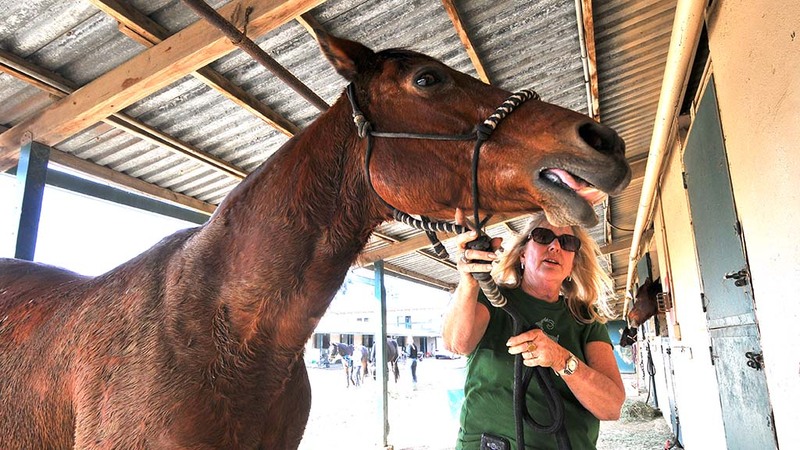 Several horse trainers risked their lives to save terrified horses when the fire roared through San Luis Rey in December, with trainer Martine Bellocq suffering third-degree burns over 60 percent of her body as she raced into a burning barn in an attempt to save a 2-year-old colt who perished in the fire. Trainer Peter Miller — who lives in Encinitas and lost five horses including the stakes winner California Diamond as a result of the blaze — will be at the awards ceremony to represent those who stayed behind to try to rescue the animals — according to the NTRA. The awards ceremony will be televised live on TVG at 5 p.m. Pacific time.